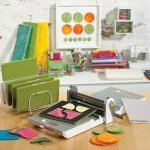 Learn how easy it is to use your Accuquilt cutter to quickly cut out all the pieces for a great sampler quilt -- you'll be ready to sew in no time! Bring your quilting project. Staff will be available to answer questions.